Back in Chrome Beta 39, Google introduced one of our favorite features to Chrome that was unfortunately, only available in select situations, and on select versions of Android. We are talking about colored toolbars, of course. When first introduced, colored toolbars (assuming a website enabled them) could only be viewed when a phone or tablet was running Lollipop and if the tabs were merged into the app switcher. We have talked about how terrible this whole merging of tabs thing is in its current state, but had hoped all along that Google would tweak the way it worked to make it easier to switch between tabs when enabled. I don’t know if they will ever do that bit, but one thing seems to be happening in the latest Chrome Beta that was a merged-tabs-only feature. Look at that image above. See it? Yes! Unmerged tabs with colored toolbars! 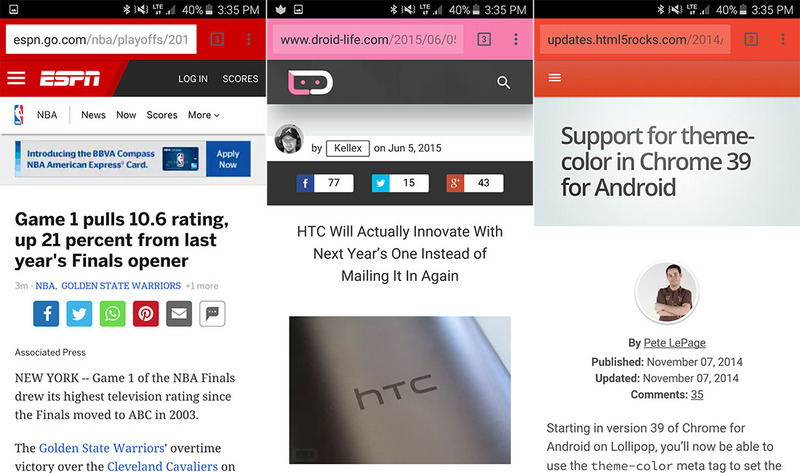 A reader of ours noticed Droid Life pink popping up on his phone, which didn’t have tabs merged (probably because his Moto X had yet to receive Lollipop and merged tabs is a Lollipop feature). We checked ours and noticed some colors appearing here or there before going away, but weren’t sure what to make of it. And then! We got them to stick, sort of. You can see them in action in the GIF below. So is this finally a feature for those who aren’t weird as hell don’t merge tabs? That we do not know. This could just be a bug that’s allowing colors to shine through temporarily. The status bar isn’t even changing colors as it should. Our hope, is that Google is enabling this for those who aren’t weird as hell don’t merge tabs and we have just stumbled into early work on it. Please be real, you all need more pink in your lives.